Mark and Sarah had a gorgeous winter celebration at the Michigan League Ballroom captured so beautifully by Violet Light Photography. Sophisticated, stylish and seasonal, Sarah wanted flowers with natural styling and interesting textures. Loose but not too loose flowing pieces and large but not too large bouquets. 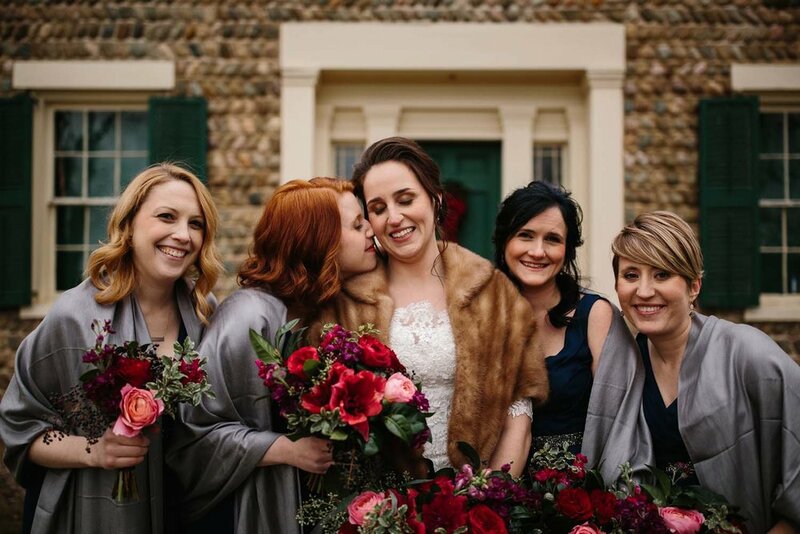 She wanted her bouquet to be a statement piece, and I hope she loved it as much as I did - I loved the blush and cranberry tones that she picked and the lush textures and natural oblong, cascading shape. And the ceremony arch design - I loved getting to create this piece, and I loved the arch that Sarah's dad created for the occasion - so much so that I bought it and can now share it with other couples. Congratulations Sarah and Mark, it was wonderful to be a part of your celebration! This wedding was classic and elegant and filed with thoughtful details. 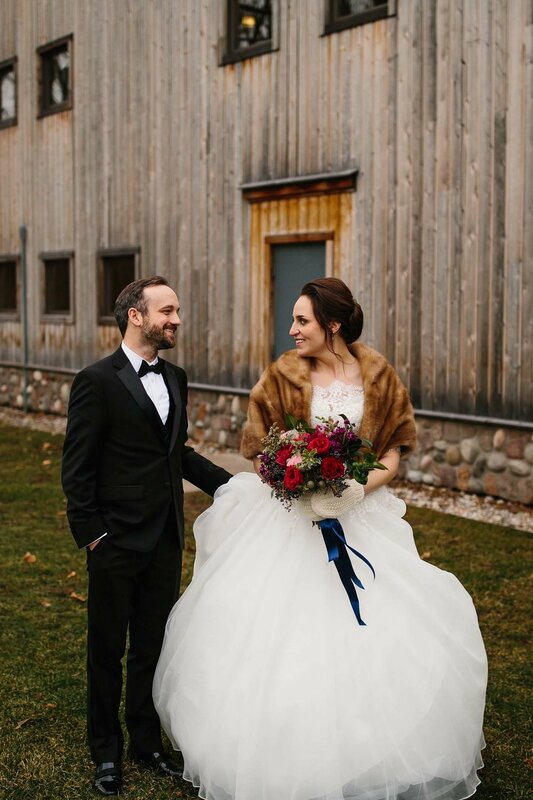 I was so excited when I heard about this reception at Ann Arbor Distilling Company - a warehouse style wedding reception right here in Ann Arbor! 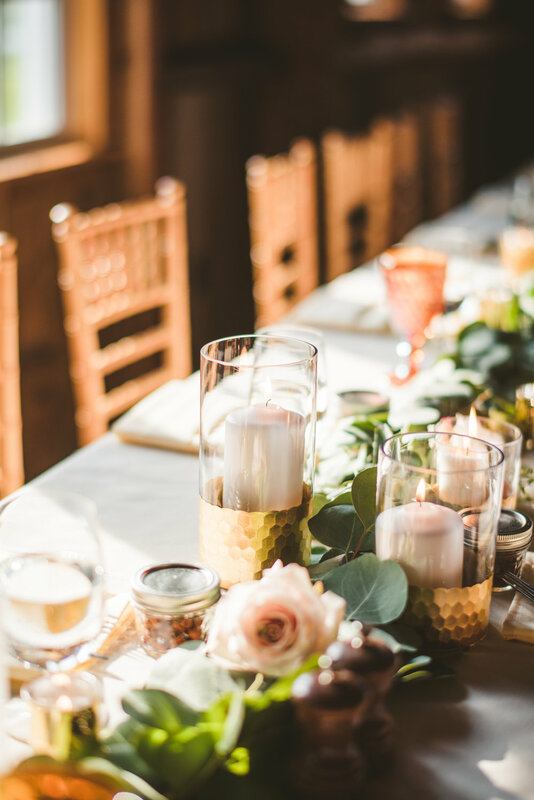 And so wonderful to get to work with truly talented vendors Melanie Reyes Photography and J.Eliza Events - so wonderful to get to be part of this team! 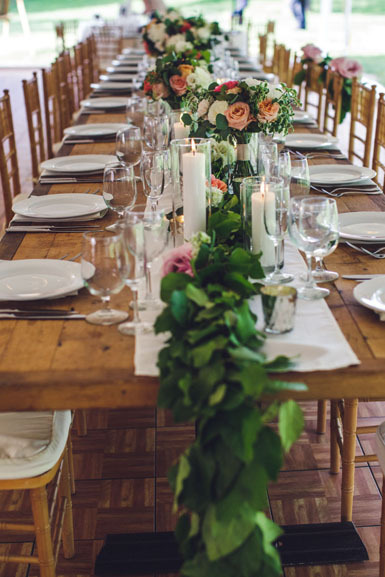 Cassie and Alan's flowers featured lush greens and natural, textural elements (including kale! ), along with a perfect autumnal splash of gold and copper - we painted succulents and apples in metallic tones and they added just that splash of something unique! Hope you love these as much as we do! There's something special about the colors of autumn in Ann Arbor and the special tones of autumnal flowers that excites me every year. Autumn brings in the most amazing dahlias and knock-out chrysanthemums, berries and textures and foliages and it's just a special time to be designing. I loved creating these pieces for a wedding celebration at the Gandy Dancer in downtown Ann Arbor, coordinated by Twofoot Creative. 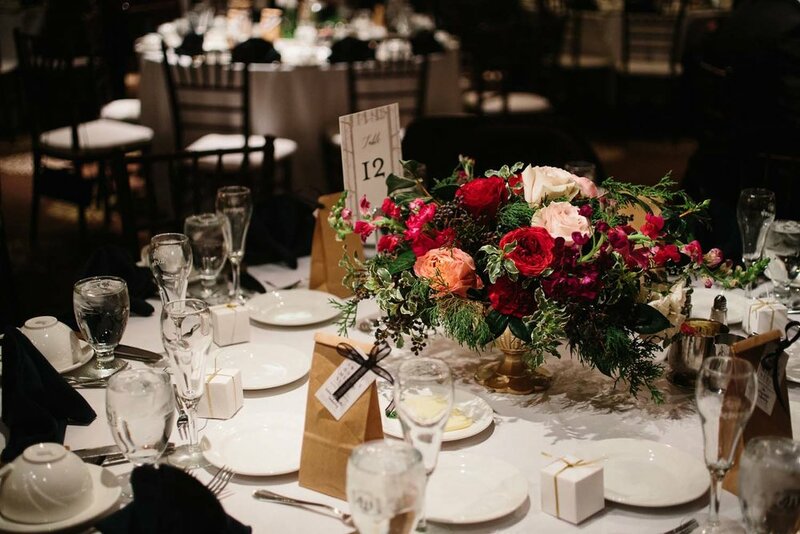 These centerpieces and accent pieces featured golden chrysanthemums, orange ranunculus, burgundy snapdragons, blush spray roses, campanella peach roses, seeded eucalyptus, olive branches (with olives! ), burgundy dahlias, blue privet berries, and a gold succulents, in a gold compote dish. So thankful for this autumn abundance! Oh how this pink romantic antike garden rose stole the show! I could not take my eyes off these the whole time we were designing these centerpieces for a sophisticated garden wedding reception at Earhart Manor in Ann Arbor. 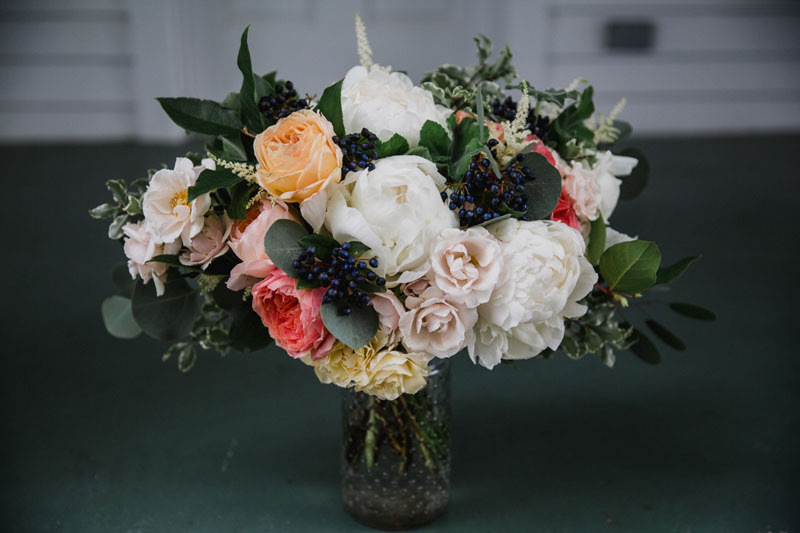 Centerpieces also included white anemone, queen anne's lace, orange free spirit roses, peach ranunculus, blush quicksand and fado roses and white majolica roses together with succulents and textured foliages.